I usually write in the "Italy" section of this forum but I think it's good to write also here in Kramer section! In the last year I bought 2 Kramer guitars, a 84 and a Baretta Vintage, both are new models made in Korea but both after a good set up (floyd on the body and neck shimming) play like a dream! The Baretta have an EMG81 (I bought used with this pick up) but I've just ordered a Duncan SH5 Custom zebra to replace it! Those are some fantastic looking instruments! I love both of them, guitarman84, but the '84 model is my favorite. 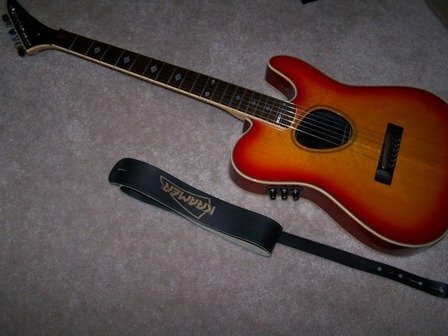 I also have a Kramer, a 1986 Ferrington acoustic/electric. Anyone know of a good site to buy a good vintage Kramer Body that isn't EBAY? Reverb dot com is great, and I also like Ed Roman guitars for such things. ...just pulled the trigger, I have bought the second '84! This one came with a Bare Knuckle vhii pickup, I'm thinking to make a 5150 replica with one of the 84 guitars..what do you think? Yeaah! This IS a nice guitar! Oh..and the Baretta with the zebra coil pick up looks way better than with the EMG! And I really like the tone of the SH 5 custom pick up, a lot better than the EMG for this guitar!